Finding felon friendly apartments or housing can be a very difficult task, much more so nowadays than it has been in the past. Countless felons are turned down by landlords and property management groups. Poor credit also can make apartment hunting problematic in the least. When you couple poor credit and a criminal background finding an apartment can seem nearly impossible. Our organization, Help For Felons has come up with some really good ways to find felon friendly apartments and housing. 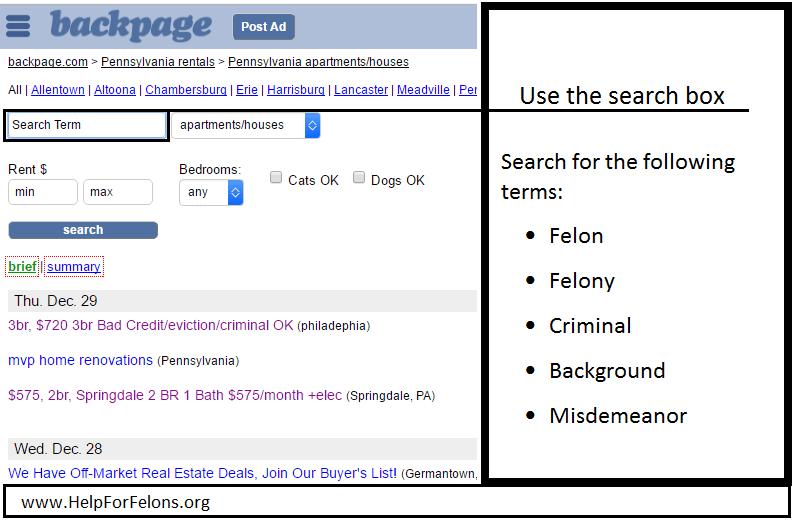 Many websites claim to list housing for felons but we have found that many of those postings and sites are either wildly inaccurate or simply spam in order to make money from advertising. What we have done instead is to provide you with the tools and knowledge that you need to actually find felon friendly apartments and housing with relative ease. If you use the tips and information listed below you should definitely be able to find a suitable housing to fit your needs if you keep your eyes open. Property management groups are very stringent regarding felons. Most of them will not consider renting an apartment to a felon under most circumstances. You can always apply but chances are you will never here back from them once they run your background check. The best chances of you renting an apartment as a felon from a management group is only if your conviction is old, over ten years or more. Often times it still does not matter how old your conviction is! For the rest of you don’t waste your time unless you have no other choice. Craigslist believe it or not is probably the best place to find felon friendly apartments and housing. The reason for this is because most of the advertisers on Craigslist are small time landlords, meaning they only own one or two rental units. Many of them will not even run a background check. Even if they do you can speak with them face to face to explain your past. When you go to craigslist select the state that you live in then select the city that is nearest to you. Find the housing section and then you can search for apartments and housing then. You can even input your maximum and minimum rent cost. When browsing through all of the listings look for townhouses, duplexes and single family homes, stay away from large apartment complexes. Most of these will be managed by individuals rather than property management companies. Any property that you see for rent that is related or managed by a property management group skip looking at, 99 percent of the time they will not even consider you as a tenant. Housing authorities (also known as HUD) are local government offices in the United States that governs housing within a city or county. They often provide low cost rent/low income or free housing to people in need. This is a great place for you to check out first to see what they have available. Many housing authorities will have housing for felons available for you to move into. If there is no housing or apartments available then at least you can get on their waiting list. Housing authorities will base you rent off of how much money you make per year. If your income is below the national poverty level then you will be given a discounted rate. If your income is far below the poverty level then you will pay very little or could possibly qualify for free housing. This should not be confused with section 8 HUD housing. A number of the housing authorities out there will have felon friendly apartments but it is possible that you may have to go through a waiting period. Sometimes this waiting period may range from three, six or twelve months from the time of release or conviction. Each housing authorities policies will vary slightly depending on the state and city that you reside in. Remember that you will want to visit their office as soon as possible in the event that there is a waiting list. Backpage is like Craigslist little brother, only a little more shady. With that being said it is much more easy to find felon friendly apartments and houses for rent. As you can see the first listing will rent to felons and others with bad credit also. It is a good idea to look at, call or email every listing possible. Ask them upfront if they would consider renting to someone that has a criminal past. If you are short on time you can always use the search box for specific terms to see what comes up. It never hurts to check with other local government offices and officials. Talk to your parole officer and see if they can help you out by giving you a list of felon friendly housing in your area. You can also talk with any re-entry programs that are in your area also as they may have some leads for you. Many states also have re-entry information for ex-offenders available from your state’s department of corrections. Don’t forget to ask friends and family if they know of any places for rent. A personal referral from a trusted person can go a long way in securing a place to live. Our article, Felony Expungement and Record Sealing offers a ton of information that could change your life in a great way. Expunging your record will not only allow you to rent anywhere you want but will also make things like finding jobs much easier. Not all states allow expungement/sealing though, you can find out more here. Having your record expunged is a fancy word for having your criminal record erased. Many people assume that this is very expensive but it is not as much as most people assume. Money talks louder than you do! Here we are talking about small time landlords, not the big corporate apartment complexes that will almost NEVER RENT TO FELONS! Landlords rent apartments for only one reason, to make money. If you can make them feel comfortable that you are financially stable and will pay your rent you have a better chance of them renting to you. If you can can pay two or three months rent upfront, on the spot with cash they may make a snap decision and rent to you on the spot. I know, I know… Most people can’t afford to do this but if it helps one person it’s worth the 1 minute of your time we wasted. Below you’ll find some useful information and tips on finding felon friendly housing and apartments. Always be honest and upfront that you are a felon IF they are going to run a background check. If someone is going to rent to you they either will or they won’t. If you say nothing and the landlord finds out down the road it will appear as if you were being deceptive. If you know for sure that the landlord is not going to run a background check then you can simply not say anything unless they ask. Don’t stress and don’t get mad. If you meet with a landlord and they will not rent to you be kind and courteous regardless. You never know what the future holds, you may very well get a call later down the road if they can’t find anyone else to rent to. Remember that when people hear the word felon they automatically think you are dangerous and/or violent. Break that stereotype by explaining what and how you made a mistake in the past. Make a good first impression. Dress nicely and shake their hand. Ask questions about the property and pay attention to any details that they give you. We at Help Help For Felons wish you all the best in finding a nice place to live. If you have questions or comments please leave them below. Good Luck!